Leo Varadkar said he has a good relationship with DUP leader Arlene Foster. The Irish prime minister says Brexit is fraying relations between Ireland and Britain. Taoiseach Leo Varadkar says it has also “undermined” the Good Friday Agreement (GFA). The Irish border is one of the biggest sticking points in the Brexit negotiations. 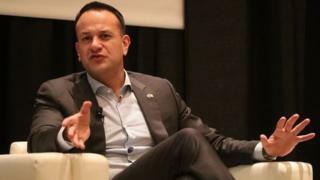 “Anything that pulls the communities apart in Northern Ireland undermines the Good Friday Agreement, and anything that pulls Britain and Ireland apart undermines that relationship,” said Mr Varadkar on RTE’s Marian Finucane programme. Mr Varadkar also said he has a good relationship with DUP leader Arlene Foster. He said the DUP and Sinn Féin need to come together and come to an agreement to get the Stormont Assembly up and running again. Northern Ireland has been without an Executive since January 2017, when the power-sharing parties – the DUP and Sinn Féin – split in a bitter row. Mr Varadkar said that if there was some clarity on Brexit in the next couple of weeks or months, there would be an opportunity to get the Executive up and running again. He also said Ireland was entering into a potentially difficult period, even if an agreement is struck. The UK and the EU both want to avoid a “hard border” between Northern Ireland and the Republic of Ireland, which may include physical checks or infrastructure, but cannot agree how. A key part of the negotiation is the controversial border “backstop”. The backstop is a position of last resort, to protect an open border on the island of Ireland in the event that the UK leaves the EU without securing an all-encompassing deal. What do ‘checks in the Irish Sea’ mean? The government has been adamant it would never accept Irish Sea customs checks. But it has also been careful not to completely close down the prospect of regulatory checks.